LadyBoy Dining – Cheeky Fun! With a name like Ladyboy Dining you are sure to strike up an interest – adding some curiosity, fun, spice and playfulness to the Richmond area. Ladyboy Dining is created by co-owners Fran Leaper and chef Mitch Townrow (Longrain) who are joined together with chef Pez Bowman (Melbourne Pub Group). As you step inside you will feel like you have been transported to Bangkok, Thailand. The colourful, cheeky fit out has been done in collaboration with Ingrain Designs. A huge colourful sign with the word SAWASDEE (a greeting to mean welcome/hello) greets you together with a large striking street art ladyboy face. Next to it is a large bright yellow sign – LADYBOY – which hangs above the bar and overlooks the entire dining room. What I love is the installation of multi coloured wastepaper baskets that have been flipped to create light shades that drape loosely from the roof across the front dining area. At the end of the bar is a slightly smaller neon blue sign – ROCK OUT WITH YOUR WOK OUT – and below that is an open kitchen where you can watch as the chefs prepare your meals. As you walk down the small walkway from the main dining area towards the back of the venue – more seating is available with a funky abstract artwork of an elephant. This leads to the back where there is a large area for the Buddha Bar complete with colourful umbrellas on the ceiling, awesome cane furniture (round, curved seating) and fake grass outside – to keep with the Thai relaxed theme. Here there is also fancy artwork of a large Buddha head on one and neon signage with the words BUDDHA BAR on the opposite side under which the wooden bar sits. The expansive courtyard will no doubt be a hit in the summer. Here you can enjoy the hawker style bar menu which includes oysters and green nahm jim, chicken wings and a selection of banh mi – all for $8, as well as salt & pepper tofu and pork hock with rum glaze. There are cheekily named drinks on their menu for offer such as Adam’s Apple and Trans-gin-der, as well as cocktail buckets and a good selection of beers and wine to try out. The menu starts off with Smaller Bites such as Betel Leaf, Oysters + Nahm Jim and Son In Law Eggs – progressing to Smaller dishes where you will find Ceviche, Larb, Papaya Salad, Pork Hock and Salt & Pepper Tofu. This is then followed up with your larger dishes that include a selection of Curries (Red Duck or Tofu Curry, Green Fish Curry, Angus Brisket Penang Curry), Whole Fish, Pad Thai and Grilled Salad. There are a handful of sides to choose from which include Rice, Stir Fried Green, Chilli + Prawn + Smoked Coconut Samabl and Cucumber + Krachai + Mustard Green Relish. The menu ends with a selection of Sweet LadyBoy Treats – where coconut features mainly – with desserts such as Coconut Sorbet, Kaffir Lime Pie + Coconut Meringue, Sago + Palm Sugar + Coconut and White Sticky Rice + Ice Cream + Thai Fruits. There is also an option to enjoy the LadyBoy’s Banquet ($45) which will give you the kitchen’s daily selection. This will require a minimum of 2 people, and if you have a table then the whole table must go on this banquet. There were four of us at dinner and we ordered the Betel Leaf + Char Grilled Calamari + Green Mango + Peanut each to start. Served on a betel leaf – the dish comes out with striking colours thanks to the chilli, coriander and peanuts. You eat the entire dish as is – betel leaf and all – and as you crunch into the first bite your tastebuds will soar just like fireworks. A combination of spice, tang and the softness of the fresh grilled calamari is breathtaking. A great way to start off your food experience at LadyBoy. From the smaller dishes we ordered Salt & Pepper Silken Tofu + Chilli Jam and Crispy Pork Hock + Rum Glaze. The Salt & Pepper Tofu was crispy and crunchy on the outside whilst being soft and billowy on the inside. The Chilli Jam that accompanied this dish was just the right consistency and had a great balance of flavours – spice and tang. The two guys really enjoyed the Pork Hock + Rum Glaze – so much so that they wanted to order another serving of the dish. Clearly a mighty delicious tasting dish. We also ordered the Green Papaya Salad + Snake Bean + Peanuts from the smaller dishes. Think slivers of green papaya mixed with freshly cut snake beans and tomatoes topped with peanuts and drizzled in spicy and tangy sauce. This dish is refreshing and sure does pack a punch; I also loved the mixture of textures that you get as you delve into it. The addition of coriander adds further depth and flavouring to the dish. From the larger dishes we ordered three dishes – Green Fish Curry + Apple Eggplant + Pea Eggplant,Dry Red Duck Curry + Snake Beans + Baby Corn and Pad Thai + Salted Calamari + Peanut. The Green Fish Curry + Apple Eggplant + Pea Eggplant. The dish comes with a generous amount of fish pieces and has just the right amount of coconut to flavour the curry. I have never eaten pea or apple eggplant before – pea eggplants is a very small eggplant and as the name suggests; resembles a pea. They were cooked whole and pop in your mouth when you bite them which release a burst of bitterness that combines nicely with the rich heat of the curry. A great dish. The duck curry was served dry and looked delicious when it was placed on the table – the vibrant colours of the red duck against the bright yellow of the sweet corn and green from the basil and bean was breathtaking. This was another dish that the table enjoyed. The Pad Thai was another well cooked and flavoured dish – served with a wedge of lime for extra tang if needed. The serving as with all the other dishes was quite generous. Dessert was definitely on the cards – out of the four desserts to choose from – I decided to order the Sago + Palm Sugar + Coconut and N ordered the Kaffir Lime Pie + Coconut Meringue. The Sago comes out served in a blue and white bowl – topped with star fruit and coconut flakes. I love anything with sago so thoroughly enjoyed this dessert. The coconut flakes added a crunch together with the star fruit adding citrusy and lime flavours. 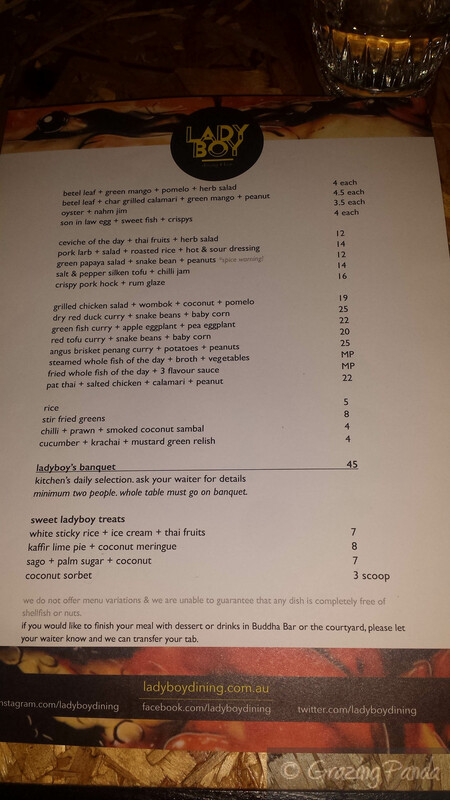 I also had a chance to try out the Kaffir Lime Pie + Coconut Meringue. I am usually not a fan of lemon meringues or key lime pies, but this version was absolutely delicious and had to be my favourite dessert of the night. The coconut meringue was generously placed and flamed to perfection on top of the kaffir lime infused pie and topped with crunchy coconut flakes. The kaffir lime was the star of the dish and together with the combination of the coconut meringue was divine. A definite must try dish that I know anyone would enjoy. The service at LadyBoy Dining is great – friendly and the staff are knowledgeable and well informed about each dish. LadyBoy is mostly for walk-ins but they do take banquet bookings in the dining area for a group of eight or more. On Sundays they serve Thai style roasts from 5pm onwards. LadyBoy Dining serves up delicious tasting Thai food with a difference – added cheek and fun! Summer days will definitely see this place packed out – especially at the Buddha Bar out the back. Get down and check out LadyBoy Dining now. Online Booking: No, however you can book for 8 or more people.